From the 60's to the 90's, many science fiction shows came to the tube. The evolution of equality of the genders is getting better but still needs improvement. Here, I will try to show the rise of woman's importance in each decade starting from the 1960's. crew had all a male main cast, the only women seen were there for only one show at a time and would be there only to see, advice but never to make the important decisions. "The Prisoner" was a story based on a man as the main character (Number 6) who was caught in a prison village because he would not say why he had quit his job. A different person in each episode played the chief of the prison village (who was called Number 2), most of the time, Number 2 was a man. At least three of the new Number Twos were women and some of the best villains. The hero said a few times that the women were always "not to be trusted"; he seemed misogynist at times. Women often betrayed him or got him in trouble. "Thunderbird" was a show done with string puppets but still all the main characters were men except for one woman who was the secretary. This program was about a secret rescue mission team that would watch for disasters or major crime. They would then fly over with their special rockets to help. "Batman" had the two superheroes as men. The police department was all male. They fought 5 main villains: the Penguin, the Riddler, the Joker and Mr. Freeze. The last was a woman; Catwoman, dressed in a very tight suit. 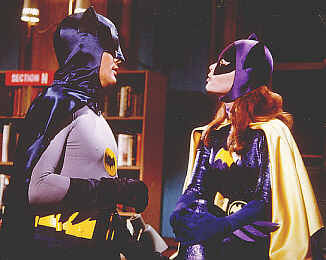 In the later seasons, there was Batgirl who would help the two superheroes. But most women seen in the show were victims. 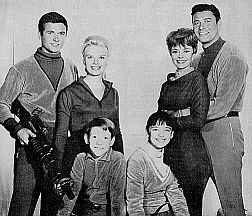 "Lost in Space" had a main cast of 3 men, 2 women, 1 boy and 1 girl. The main decisions were always made by the two men. The story is a family going into outer space and by an anomaly, they find themselves stranded on the other side of the galaxy. Each episode is a fight for survival against hostile environments, aliens or monsters. At least in one episode when the 2 men had to leave the ship, the father said to his son that he was the man of the ship until they got back and he had to protect the women. The original "Star Trek" had mostly men as the main characters but finally, there was at last, a woman in charge of communications. The show is the story of a spaceship and its crew encountering spatial anomalies, alien races and bizarre encounters or accidents. The two main alien races encountered the most were the Romulans and the Klingons. The top brass were all men and even in the last show, it was said that women could never become captain, this was the cause of that shows conflict. The first pilot "The Cage" had a woman as second in command but Gene Roddenberry had to remove her. The men in charge of the TV network could not accept a woman so high in the command structure. The women's clothes in the show were quite sexist. Also, there was a woman's chaser, the captain. "Ultraman" was a series featuring a male scientist who created Ultraman to help humanity. Women in the show would only be screaming victims. "Star Lost" had two men and a woman as the main characters, but still the main decisions were taken by the men. The woman would give advice, sometimes she would be listened to, sometimes not. Here, the story is about an space called the "Ark" created to save the last of mankind. The Ark has different bio-domes where the people in each of them think they are alone in the universe. The Ark is on a collision course with a star and the three heroes are trying to find a way to change the Ark’s course. "The Six Million Dollar Man" had the three major characters as men. The only two women were a secretary and a lab assistant. The story is about a man who lost his two legs, an arm and an eye in an aircraft accident. His broken parts are replaced by bionic parts. He has super powers and sent on extremely dangerous missions. "Space: 1999" had a man in charge and a alien woman as the chief scientist. The woman was in charge when the man was not there. This show was probably one of the first to have a woman sometimes in charge. In both seasons, the chief medical officer was a woman. "Wonder Woman" had a man and a woman as the stars. Wonder Woman was the star but in her day job, she was only the secretary of the man. When she was fighting crime, her costume was very sexist. One good thing of this program was that her powers were her own. She came from an island where women all had these super powers. "Bionic Woman" was made possible because fans made an uproar against her death in the "Six Million Dollar Man". Her strengths were bionic so not natural. She had lost both her legs, an arm and an ear in a parachute accident. She was sent on difficult missions where her strengths could be used. Her boss and the doctor were men. As in the "Six Million Dollar Man", the only two other women were a secretary and a lab assistant. "The Man from Atlantis" had a man as the star who could breathe air or under water. The second major character was a woman scientist who showed her bosses the man's abilities. The stories would be almost all sea related where the man’s underwater breathing would help in their missions. But it was still men who would decide the missions they would undertake. There was one science fiction series where the women were definitely on top, a British French German production called "Star Maidens". First it was about the two suppressed men escaping via spaceship to Earth. The series seems to have been filmed as two halves, for in the first half was about the two men's adventures in our male society. The second half of the series was actually on the new planet where an Earth scientist and his assistant were kidnapped as hostages. He had to learn what it was like to be on the subservient side of the social standing and watch his female assistant become his boss. They played the women a little bit silly but nonetheless still in charge. You would have thought a female controlled society would be less concerned about their vanity and would not wear mini skirts. Nonetheless this was the way these women dressed and behaved. 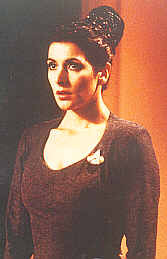 "Blake's 7" was where the lead bad person was a woman, Supreme Commander Servalan. Other woman had key parts, Jenna was the pilot who had once had her own ship but was captured smuggling. The resident alien female was a rebel fighter and part telepath. As this was an English show of course they received fairer treatment. Nonetheless, they deferred to the men and wore impractical costumes. "Battlestar Galactica" had men as stars and in charge. Finally, women were accepted as fighter pilots but not as squadron leaders. One woman was a medical officer. In one episode one member of the council was prominent and it was a woman. The story is about humanity living as twelve tribes on twelve different planets. They are attacked by a robot race that wants to annihilate all humanity. The survivors get on all available ships to evade the robots and finding the 13th tribe (Earth). "Buck Rogers in the 25th Century" had in the first season, a man and a woman as lead characters; in the second, there were 2 men and a woman. Their commander was still a man. 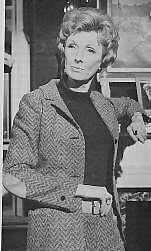 In the first season, the woman, Colonel Dearing was a strong woman and in charge of Earth’s defense forces. She would take some major decisions but her clothing was still quite sexist. They would go on different worlds to save people in distress and protect Earth. Most of the first season the head villain was a woman. In the second season Colonel Dearing became a stewardess and wore a mini dress, and behaved more like a 20th century woman. The main story in the second season is a search spaceship that searches for missing earth people and encounters new races. "My Secret Identity" had a boy and a man as the main stars. By accident, the boy received a beam that gave him super powers. He would try to help people in distress, trying to stay anonymous. Women had just background roles, like his mother and his sister. "Star Trek: The Next Generation" is the story of a spaceship that encounters new worlds and the main foes are still the Romulans, but the Klingons are allies. Another major threat is the Borg collective that assimilates the different races it encounters. Many other species are seen on the ship, on other ships or on different planets. The show started with 3 women and 6 men as the main cast. Finally, they were in important positions as chief medical officer, ship's counselor and head of security. Denise Crosby, head of security, quit during the first season and her role was replaced by a man, a male Klingon. In some episodes, you would see other women being captains of other ships and even some as admirals. One of the drawbacks though, they had to wear an apparatus that would raise their breasts so that they would seem bigger than normal. This time, the woman chaser was the second in command. "Seaquest DSV" and "Seaquest 2032" is the story of a submarine that encounters different dangers in the sea, and a few even from outer space. The show had only 2 different women in the main cast, but not the same ones in each of the seasons. Though in two seasons, the doctor was a woman, their role did not seem too important as doctors. One of the woman was weak and would break too easily under pressure. "Star Trek: Deep Space Nine" is a show about a station in outer space close to a wormhole that leads to another part of the galaxy. Though at the beginning, the main foes are the Cardassians, the Dominion on the other side of the wormhole becomes a serious threat also. The show has only two women in the main cast. Finally, one of them is second in command on the station and the other is high in the command structure. Some women in the minor roles have very sexist costumes. As "Star Trek: The Next Generation", women had to wear an apparatus that would raise their breasts so that they would seem bigger than normal. This time, the woman chaser is the chief medical officer. "Babylon 5" was a commerce and peacekeeping station for the different alien races. The station management is from Earth but the council is represented by the major powers. The station becomes a focal point when a galactic was breaks out. The show had 4 women in the leading roles in the first 2 seasons, and 3 in the next 2. The woman that was only for the first 2 seasons (played by a different actress in each season) was an aide to the Narn ambassador. One important person that the station needs is a telepath who is a woman; one female telepath stayed for 3 seasons and another woman telepath took over in the next 2 seasons. One woman is the second in command of the station, she has a strong character and is a great leader. Lastly, the Minbari ambassador is a woman who has been on the gray Council that is the ruling body of her world. She was even asked to be the leader of the council but she refused. "Earth 2" is the story of the scout ship’s crew that has to travel by ground to start a new colony for Earth. They encounter problems with the aliens' life of the new planet and even adversity between themselves. The show had 9 major characters: 3 women, 4 men, a boy and a girl. After the death of the commanding officer, it was a woman that was in charge of the mission, she had a strong character and was a good leader. The doctor of the mission was also a woman. "Star Trek: Voyager" is the story of two starships that were brought to the other side of the galaxy by an alien entity. One of the ships is destroyed and the crews of different backgrounds are now together on the same ship trying to get back home. The first two seasons, they encounter two main foes. After, they encounter different races, some friendly, some not. Finally the captain is a woman who can lead the crew with a strong hand. The chief engineer is a half-human half-klingon woman who had to learn to control her temper and is very good in her position. In the first three seasons, the third woman had telekinetic powers. In the fourth season, the third woman is a human who was assimilated by the Borg at an early age. As "Star Trek: The Next Generation" and "Star Trek: Deep Space Nine", women had to wear an apparatus that would raise their breasts so that they would seem bigger than normal. This time, the woman chaser is only the helmsman. In the lead characters there are 3 women for six men. "Space: Above and Beyond" is the story of the Earth Force fighting an unknown alien race. The show had 4 men and 2 women as lead characters. The commanding officer was a man but the squadron leader was one of the women. The interaction in the squadron was great. "Xena: Warrior Princess" happens in the time of Hercules. As Hercules, she fights different foes and dangers. The show has 2 leading women, they are strong in their characters but their clothing is too sexually oriented. Though some improvements have been made through the years, there is a long way still for equality of the sexes in science fiction. Main reason being that most of the shows come from the United States where they are still about 15 to 20 years behind Canada. There are other countries like Norway that is closer to equality of the sexes.